Honda Tractors – Formula H Motorworks, Inc. Formula H specializes in the sales of pre-owned 5000 series tractors and their attachments. Though they haven’t been part of Honda’s product lineup since 1998, they are revered by their owners and remain sought after by people in the know. When you think Honda Tractors, think Formula H! The Honda 5000 series of tractors – RT5000, H5013, H5518 – are true multi-purpose machines with four wheel drive standard on most models and four wheel steering as standard equipment. An available series of attachments includes front mounted dozer blades, snowblowers, and sweepers. Additionally, there are three different 46″ mid-mount mower decks (depending upon the tractor model), as well as a 52′” deck for the 5518. Lastly, with the addition of the optional rear lift and three point hitch kit, Honda offered the following rear mount attachments; rototiller, brush hog (rough cut mower), moldboard plow, and spring shank cultivator. They retain a cult-like following among owners today with an appreciation for their engineering features and functionality. One of their biggest fans is co-owner Brian Baker, who owns an H5518A4 model with four wheel drive and a number of the available attachments. Formula H also has an H5518 as part of it’s equipment lineup to help remove snow and keep our grounds trim. 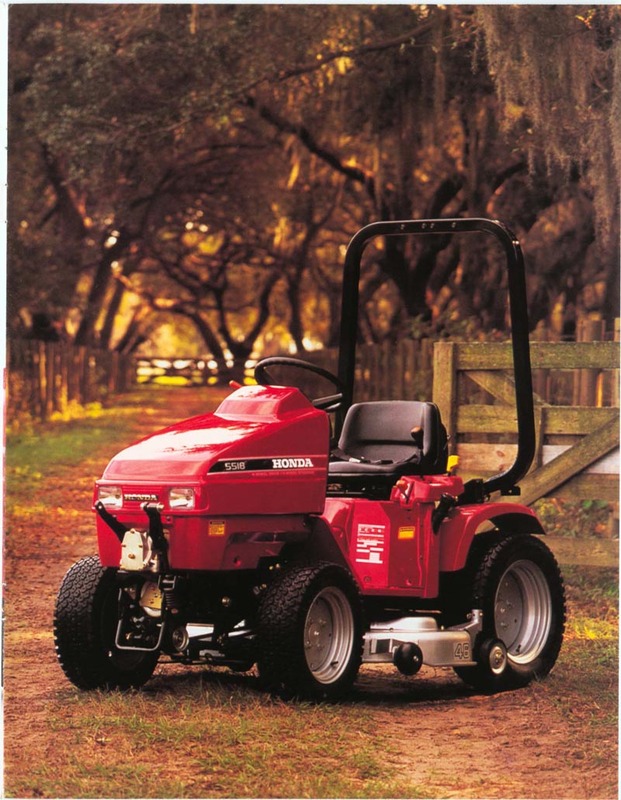 The 5000 series of tractors were available in Honda Power Equipment’s product line from 1987 to 1998. The RT5000 was the original model of the series and like the H5013 which followed it 4 years later, it was powered by Honda’s GX series commercial grade single cylinder, air-cooled engines. RT5000s have an 11 HP GX340, while the H5013 models have a 13 HP GX390. The top of the line H5518 has an 18 HP overhead cam, liquid-cooled, twin cylinder GX640. Unfortunately, many Honda Power Equipment dealers have all but forgotten them, choosing to focus on only the current product line. Many dealers also have technicians who no longer have experience with the products. Many dealers find themselves with little desire to involve themselves with the 5000 series tractors from a parts and service standpoint. This is where Formula H comes in. With an enthusiastic owner, technicians and staff with experience and knowledge, we distinguish ourselves to be among the few dealers that can help proud owners with their parts and service needs. We receive calls for, and ship, tractors, attachments, and parts on an international basis. At all times we have an inventory of pre-owned and fully serviced examples of tractors and attachments. We offer our own limited 12 month warranty on all of the pre-owned tractors we sell. We keep track of our past Honda Tractor & Attachment sales for appraisal research and general information about the parts and accessories available. We’ve probably seen it all!